With high-profile new construction happening on campus, sometimes it’s easy to overlook many of the renovations, upgrades and other improvements happening on the Corvallis campus. One certain project, however, won’t be so easy to overlook, as it will span five years, require two phases and affect between 400 and 500 faculty, staff and students in the Colleges of Science and Agricultural Sciences. The Cordley Hall renewal project, which began this summer and is expected to wrap up in 2024, will reverberate across campus, but when it is complete Cordley Hall will be the centerpiece of life sciences research and learning on campus. Cordley Hall was built in two phases, starting in 1956 and completed in 1965. It was a typical academic and lab building for its time. Science, research and teaching have all changed and Cordley Hall is no longer meeting the needs of the students and researchers using the building. In addition, many of the mechanical systems are out-of-date or on the edge of failing. In 2017 the Infrastructure Working Group, a group established in 2016 that recommends and rates infrastructure projects to the Board of Trustees and university leadership, named Cordley Hall its top priority. Cordley Hall suffers from years of deferred maintenance and budget cuts. Recent increases to the deferred maintenance and capital renewal budgets from both the university’s E&G funds and state bond funding are allowing the university to renovate Cordley Hall from a dark, outdated building to a 235,000 square feet of modern research and teaching space for the life sciences. The first step to the multi-year project was to find an overflow space to hold the researchers and their labs while the renovations take place. In June 2018, OSU purchased an existing research building 4575 SW Research Way to serve as a new STEM building. 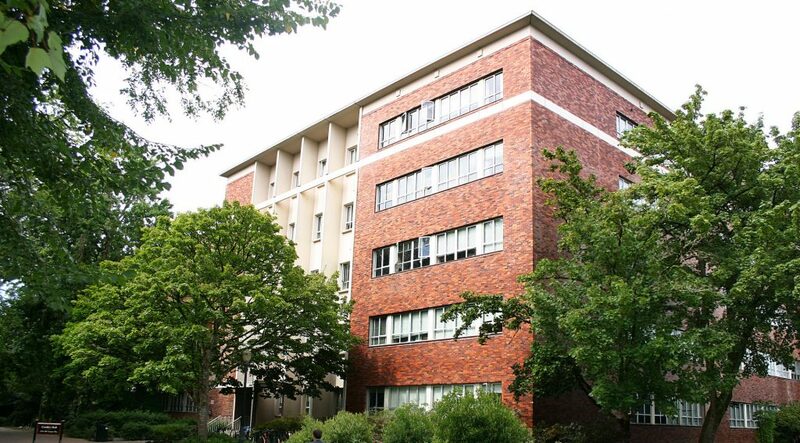 But before that happens, the building will be remodeled to act as temporary surge space for those researchers displaced by the Cordley Hall renovations. The renovations at Cordley Hall will be a two-part process. One half of the building will move out to 4575 SW Research Way and, while empty, be completely renovated. After that, the first half will move back in and the second half of the building will move out. The renewal project has already begun; in the summer of 2017, Cordley Hall’s roof was replaced. It’s a good start to the project; after all, the project was completed on time and under budget. The last time the roof was replaced, explains John Gremmels, the university’s capital planner, was about 25 or 30 years ago, when construction standards and energy codes were a lot different. In addition to the new roof, eight inches of insulation was added to help save energy by keeping warm air in or out, depending on the season. “When we renovate, we’re always looking for ways to passively save energy. Passive systems rarely break.” Gremmels explained. The next goal is to make improvements to life safety systems, such as fire alarms and sprinklers, and upgrading the HVAC system. Also in the renovation plan will be upgrades to the electrical and plumbing systems of the building, replacing exterior windows and improving the accessibility of Cordley Hall’s restrooms and hallways. Along with the renovation comes a renewal of Cordley Hall’s labs, classrooms, collection spaces and collaboration spaces. “The renewal of Cordley Hall will be adding value to our campus and our science programs by creating a state-of-the-art facility where there was none, saving the university money by using existing infrastructure — and we’ll no longer spending money be managing its decline, “said Gremmels.